I saw this link on the Bakersfield Gay and Lesbian Center Facebook page this morning. I was a homeless gay teen. I was kicked out of the house when I was 15 years old for not wanting to visit my mother in the hospital. I was homeless for 6 months wondering day-to-day when I was going to get my next meal. 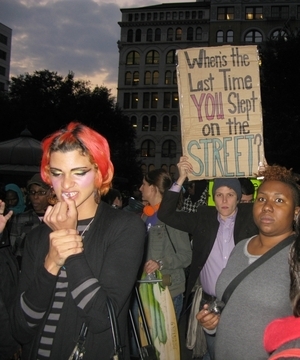 I was homeless again when I was 17 years old because my mother rejected me for being gay. She confronted me about being gay then 2 weeks later kicked me out of the house. She made me choose between being gay and being her son. I know what it’s like to be homeless so I understand this story more than anyone in the world. This article says that there are 3,800 homeless teens in New York City and only 250 beds. I have a solution if anyone will hear me out. Anyone who identifies as Gay, Lesbian, Bisexual or Transgendered or even a PFLAG member can invite them into their home to stay with them for a short time. Help them get their GED (if they didn’t get to graduate high school) and help them find a job. After 3 months they will have enough money saved up to get their own apartment and it will all be because you helped them. When I was homeless the second time around, the Salvation Army church helped me but they weren’t allowed to know that I was gay because if they found out, they would have kicked me out. Being rejected once by your family is one thing but then to be rejected by the church is devastating. If we are going to tell them that it gets better, we need to prove it by showing them that it gets better by helping them. Think of it as adopting a child, because they are still children after all. These children are teenagers but they are still children whose childhood was taken away from them. Give it back to them by helping them get off the streets. And you parents, you should be ashamed of yourselves. Waiting until their 18th birthday to kick out your own child just because they are gay. Especially around the holidays. SHAME SHAME SHAME! You kick them out of the house because your religion says that it’s wrong. So abandoning them is right? You think they are going to hell? So you think that God will approve of how you treated your child? Think again.